Another one that I loved doing last year and the 2009 version promises to be bigger and better! 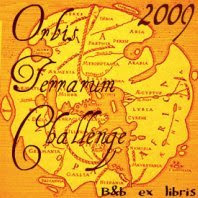 For all info and to sign-up, visit the dedicated blog - and don't miss Bethany's blog either, Orbis Terrarum is her fabulous idea. The challenge is to read 9 books by authors from 9 different countries in 9 months. My possibilities are listed below. Good luck, you challenge-crazed person :P You picked some good ones. Love in the Time of Cholera is one of my all-time favourites. Oooh. Thanks for the heads up on this one. It would merge nicely with the Lost in Translation and Around the World in 80 Books Challenges, wouldn't it?! Great list! I loved The Bone People--hope you do, too. I haven't signed up officially for this one yet, but I do have my list written out. Trish - i've heard interesting things about The Bone People! Looking forward to seeing your list! The Museum will host several public programs over the course of the exhibition’s run that will put Némirovsky’s work and life into historical and literary context. Book clubs and groups are invited to the Museum for tours and discussions in the exhibition’s adjacent Salon (by appointment). It is the Museum’s hope that the exhibit will engage visitors and promote dialogue about this extraordinary writer and the complex time in which she lived and died. To book a group tour, please contact Chris Lopez at 646.437.4304 or clopez@mjhnyc.org. Please visit our website at www.mjhnyc.org for up-to-date information about upcoming public programs or to join our e-bulletin list. Hannah - thanks for the info! Reg - I'm looking forward to it, I've heard so many good things!